While social media has long seemed like a thing solely for the “young folks,” seniors these days are changing that perception. 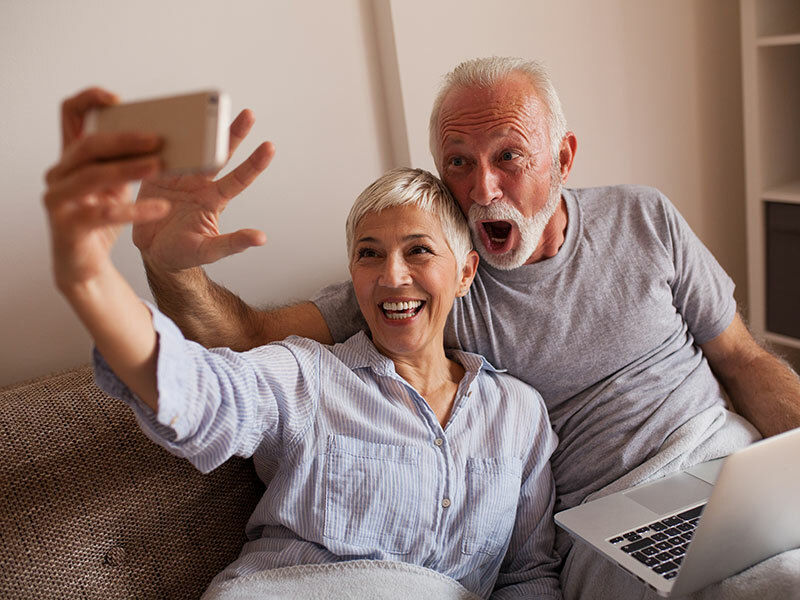 The Pew Research Center reports that seniors age 65 and older are joining social media at an accelerated rate and have become the largest growing demographic of adopters out there (even over Gen X and Millennials). It’s estimated that by 2020, approximately 50 million seniors will be on a social media platform. “Social media has completely changed the communication landscape,” says Heather Battey, Executive Director at amavida, a senior living community in Fort Myers, Florida. “People of all generations and ages can now share interests, connect and communicate with just the click of a button. And while pop culture likes to poke fun at the older generation as being clueless to these new forms of communication, the truth is that seniors have seen its value and are embracing it wholeheartedly.” So much so, in fact, that research shows that more seniors use social media every day than read the newspaper. It makes it easy to communicate. No matter where a senior may live – across the street, across the state or across the country – staying in touch with friends and family members is incredibly important (as it is to all of us). Social media allows seniors to see and talk to the people they care about at any time – without having to hop in the car or fly on a plane. Skype, FaceTime and other video chat software allow Grandma and Grandpa to see their new grandbaby, easily, without having to worry about naptime or tantrums. They can also stay in touch with what everyone is doing in real time, so they can stay in the loop – Instagram, Facebook and other picture-sharing sites can let you scroll through (and interact with) the posted photos of all your friends and family, so you can see how your daughter is enjoying her vacation with the family. It allows you to reconnect with long-lost friends and family. Social media sites allow us to find and follow long-lost cousins, old school friends and other people you lost touch with long ago. And sometimes, it’s easier than you think to find them. For example, your high school may have a Facebook group you can join to share old photos and reminisce. Some people have put together private groups for their family members in order to share news within a cultivated circle. Make new friends. Remember the days when getting together with someone you met on the Internet was weird and worrisome? These days, making new friends (and even love interests for some) is as common and accepted as striking up a conversation with someone you met at a local hangout. Social media is filled with groups clustered around certain interests or hobbies. Depending on how IRL (that’s “in real life”) you want to be, you can search for groups in your area that also have face-to-face meetups. It’s a great place to get medical advice. We’re not talking about googling your symptoms and seeing what you might have (which can throw even the healthiest of us into a tizzy). Instead, it can be used as a tool to seek out information on an illness or condition that a senior has been diagnosed with. Chronic health diseases like Parkinson’s, diabetes or even Alzheimer’s have a plethora of organizations and information available online. Not only can you learn about the disease as well as new treatments that might be available, but you can also connect with others who are living with similar conditions. It helps bridge the generational gap. If you’ve ever wished you were able to be more in touch with your grandkids, social media is a great way to do that. From sharing funny cat videos to learning about the hottest new music that kids enjoy to even (gasp) having conversations with them via comments or chats, social media is one of the best ways to reach out to the younger gen on their terms. Whether you’re a social media guru or just dipping your toe into the tech pool, it’s important to take steps to keep yourself safe on the Internet. Facebook and other sites have privacy protections that allow you to limit who can view and share your posts and pictures. Generally speaking, you can be as visible – or invisible – as you want, without skipping social media altogether. You also have the option to block people who follow you if you don’t trust or know them. While the majority of people on the Internet have good intentions, there are some less-than-savory characters out there, so follow best practices. Don’t put your personal information on social media (that includes your address and phone number), and don’t share your information with anyone you don’t know or trust. Sometimes, hackers can pretend to be someone you know (for example, they may make a profile using your grandchild’s photos) in order to solicit money from relatives. Be wary of any request you receive, and if in doubt, verify through another channel. However, don’t let the thought of a few bad apples ruin your enjoyment of the whole bushel. “Social media can open up a world of possibilities to seniors, no matter their health or ability level,” says Heather.